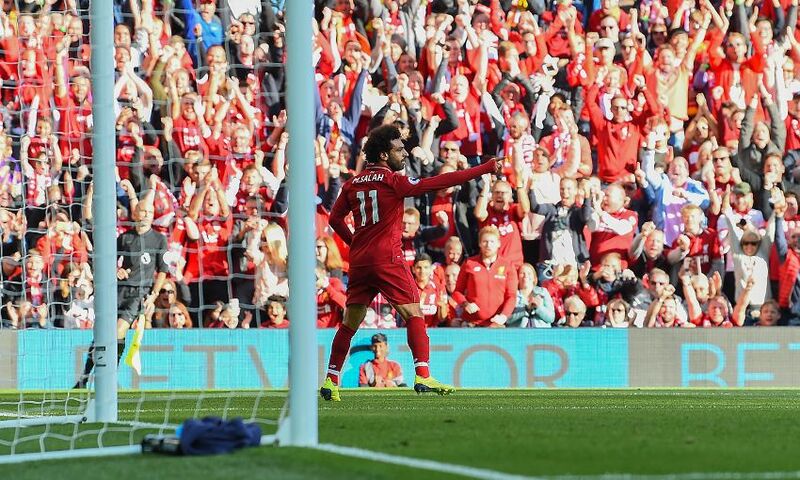 Mohamed Salah scored the only goal of the game as Liverpool continued their perfect start to 2018-19 at Anfield on Saturday. The Reds edged past Brighton and Hove Albion to record their third successive win and clean sheet in the Premier League. The ability to grind out victories when nowhere near your best is key to any title challenge and Liverpool have shown over the past week they can do just that. The Reds cashed in on Manchester City’s surprise slip up at Wolves to climb to the top of the table. That counts for little at this stage but this is a squad built to ensure they have a genuine chance of staying there. Liverpool no longer have to be at their sparkling best going forward to win games because Klopp has added defensive resilience to attacking flair. Remarkably, the Reds have scored 20 league goals without reply at Anfield dating back to February and that represents the club's best run since 1987/88. Three games, three victories, three precious clean sheets. Alisson Becker has yet to pick the ball out of the net. Liverpool have made the start to the season they wanted even if they have yet to hit the giddy heights of the latter part of the last campaign. Jürgen Klopp named an unchanged side for the third time in three matches and watched his players collect a third win, moving to the top of the Premier League in the process. Klopp has been there before, though it was almost two years ago and only a brief visit. In each of his three previous seasons in England the German has had to witness teams either running away with the league (Manchester City and Chelsea) or proving uncatchable (Leicester City). This time Liverpool are understandably keen to be the ones staying a step ahead, and though there is a long way to go they are setting the pace, with some room left for improvement. Salah made a mockery of suggestions that he is enduring a slow start to the new campaign as he supplemented the impressive numbers he has already stacked up this term. That’s two goals, an assist and one penalty win so far for the Egyptian, whose pace and trickery also led to a red card for Aaron Wan-Bissaka in Monday’s win over Crystal Palace. Incredibly, his opener made it 29 goals in as many appearances at Anfield since returning to England last summer. We may not be witnessing another 44-goal season from the former AS Roma man, but it’ll take something special for his mantle as the Reds’ best player to be threatened. Klopp has been keen to temper expectations, warning his side of the challenges to come. Positive press, he feels, can be as much a distraction as negative headlines. Liverpool have enough obstacles to overcome without getting in their own way as well. But in a season of fine margins, a perfect start – in terms of results, if not necessarily performances – should not be downplayed. City, at Wolves, showed the pitfalls which await even the best teams. Klopp aims to ensure Liverpool are ready to win, whether at their best or far from it. Today, they were far from it. “Maybe it’s my English,” Klopp joked after seeing his side’s levels drop following the half-time interval. With Salah though, he has the trump card. Plenty have doubted whether he can possibly repeat his 44-goal heroics from last season, but with two from three already, he is very much back in the groove.